To become a wildland firefighter, you must have training (provided by the DNR) and pass a physical fitness test at the moderate level. The DNR employs two types of firefighters: emergency intermittent positions know as smokechasers, fire lead response, and fire technicians, and seasonal positions. Firefighter fighting a forest fire. This position is hired directly by DNR Area Forestry offices. This is irregular, short-term work during high fire danger periods in the spring and fall. Smokechasers are most often local residents. If you are interested in a smokechaser or firefighter position, contact the DNR Area Forestry office closest to where you want to work. All positions are hired locally. Available jobs are posted on the state employment website. 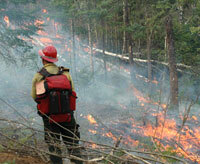 Positions with wildland fire and prescribed fire duties are: NR Lead Fire Response, NR Tech, and General Laborer. 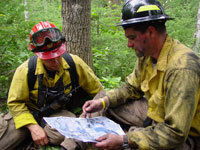 Longer-term seasonal fire positions are often available through the U.S. Forest Service, U.S. Fish and Wildlife Service, National Park Service, Bureau of Indian Affairs, and Bureau of Land Management, which assemble seasonal wildland fire crews for deployment throughout the United States. All federal jobs are posted at www.usajobs.gov.